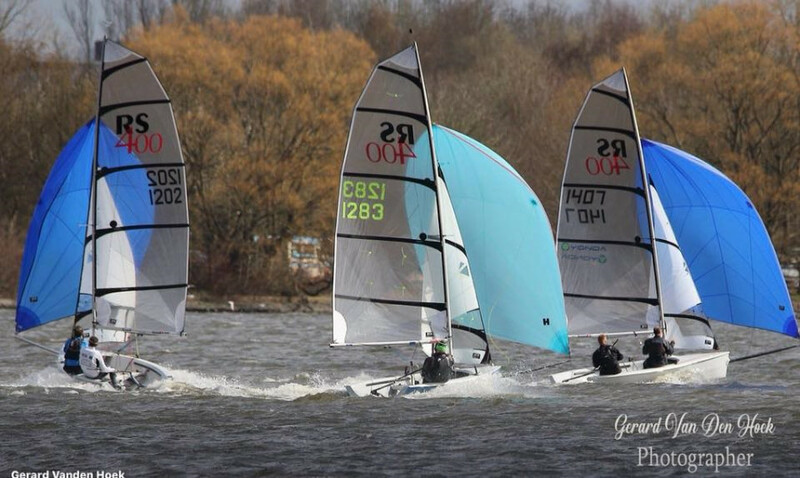 There was an awesome turnout of 26 boats at Leigh and Lowton Sailing Club near Manchester for the RS400 Rope4Boats and Rooster Winter Championship over the weekend of 23/24th March. As crews were rigging their boats a quick look around the dinghy park made them aware of the high quality of competition present and the anticipation grew nicely as the breeze gently eased up to a force 2 gusting 3 for the first race. The first start was abandoned by the PRO’s Gareth & Jenny Williams as a 60 degree wind shift hit the fleet with 30 seconds to go to the start. After resetting the line and windward mark, the fleet got away on a tightly packed start line. Hamish Gledhill and Simon Dowse (West Riding S.C.) were first to tack away from the port bias line and lead to the windward mark with the rest of the fleet fighting it out for clear air behind them. Hamish and Simon stayed cool under pressure and pulled away from the following pack headed up by Richard Catchpole and Gary Coop (Leigh and Lowton S. C.) to take the win. Chris Pickles and Matt Sharman (Bassenthwaite S.C.) completed the mother of all comebacks after a shaky start to finish 2nd just ahead of Richard and Gary in 3rd. After a hot lunch by the new Leigh and Lowton Galley staff, the fleet were beginning to get a little more confident and after a couple of attempts got away for the second race, under black flag claiming a couple of victims in the process. This time Chris and Matt led from the pin end of the line, and arrived at the windward mark together with Richard and Gary just ahead of a choker block bunch all wanting their piece of the action. A few gentle taps and a couple of spins for one or two culprits sorted out the order for the downwind which by now was clear to by paying down the right hand bank, so everyone piled down there only to meet up all together once again for another choker mark rounding. Richard and Gary held off Chris and Matt to take the win, followed by Sean Cleary and Annalise Nixon (Oxford S.C.) who were now beginning to find their feet in the crowded, shifting conditions. For the 3rd race Hamish and Simon once again got away cleanly and once again found the groove that separated them from the rest of the fleet, taking the win from a consistent Chris and Matt in second and once again Sean and Annalise took third. 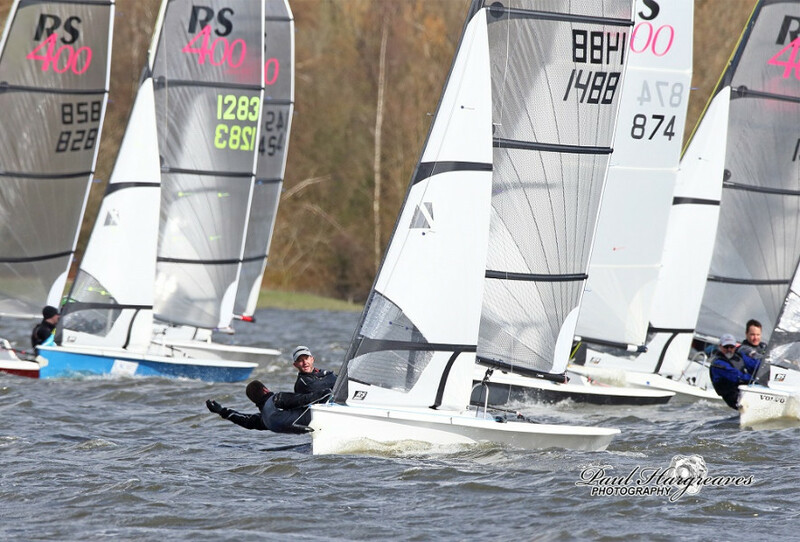 Teams were excited to see a solid F4 blowing straight down Pennington Flash awaiting them for the 4th race on Sunday morning and ventured out straight onto the plane before they even had chance to put their rudder blades down. By the time the race was underway, it had already built to a F5 and some exciting racing was in prospect. 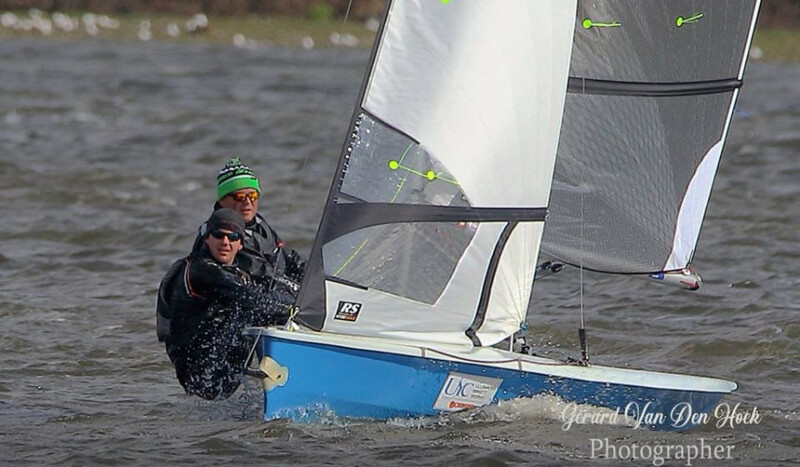 Mike Sims and Andrew George (Carsington S.C) were like a rabbit out of a trap and already had a 50 yard lead by the windward mark in the strong gusty conditions. Mike and Andrew held their lead all the way to the finish with a battle ensuing behind them. In the end Dave Exley and Nigel Hall (Leigh and Lowton SC) came through to take second, closely followed by the consistent Sean and Annalise in third. By the time the next race was in the sequence the wind had strengthened again. Having at last blown away their winter cobwebs, Jon Heissig and Niki Griffin battled out at the front with Chris and Matt, Dave and Nige, Hamish and Simon and Mike and Andrew in hot pursuit. Elsewhere boats were being laid flat and bodies were being tested in some of the gusts. 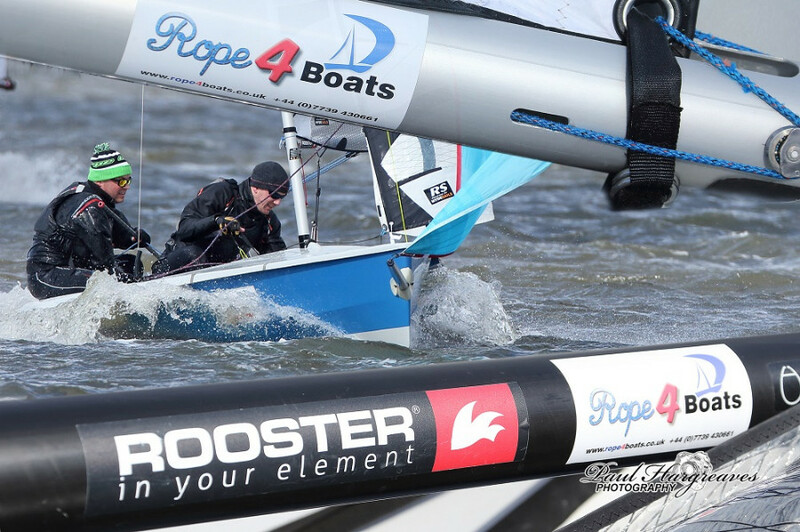 Nick Holt’s (Scaling Dam S.C.) finger was badly cut by the capsizing mast of Chris Williams and Martin Spenser (Leigh and Lowton S.C) as their boom decided to break in half. Nick’s finger was attended to off the water by Anna Walsh (Leigh and Lowton S.C.) who had just come ashore because her helm Paul Heath was caught posing for the photographer on their upturned hull. Anna, who is a surgeon in real life was seen by all using a hammer on a nail in a not so precise way during the previous evening’s entertainment, gave Nick the confidence that she know exactly what she was doing!! By the end of the wash cycle John and Nicky held off Dave and Nige by a couple of boat lengths for the win and Hamish and Simon fought hard for their equally close 3rd place. As the wind once again inched up the Beaufort scale to gusting F6 a depleted fleet assembled at the start line. The points were close and any one of the top 3 boats could win the event. Once again Mike and Andrew took off like a missile from the port end of the line and rapidly built a comfortable lead, handing on in their wake were Sean and Annalise and Dave and Nige with most of the fleet now just being comfortable to stay upright. Mike and Andrew got to the windward mark and waved bye bye to the fleet as they bore off into a gust. Sean and Annalise were leading the chasing pack who were all approaching the windward mark on starboard at the same time as big gusty header hit the group creating panic; some manged to do emergency tacks to avoid other boats and those that couldn’t ended up in irons trying to make the mark or bailing out behind the not so in control pack. As the run took shape the gusts strengthened yet another notch and Hamish and Simon capsized in front of the club house during an aborted gybe to the applause of spectators. Chris and Matt blasted past them with big grins on their faces knowing that the event was there for the taking. By the time the fleet rounded the leeward mark further F6 gusts meant that now six boats were upside down needing assistance and, with only 2 rescue boats and the race rapidly becoming 2nd priority, the PRO took the decision to abandon, handing Hamish and Simon the event, which Hamish later graciously acknowledged was mostly down to the fact that he was wearing his lucky socks! In his prize winning speech Hamish thanked all the team at Leigh and Lowton SC for a well run sailing and social event and everyone departed ready to sleep very soundly on Sunday night! Rooster donated prizes for the furthest traveller which was easily won by John Gay and Amanda Henderson from Lochaber Yacht Club in Fort William. Rooster also donated a raffle prize won by Matt Velamail and Tim Brownell (Ulley SC). Rope4Boats donated a £20 voucher won by Ross Ryan and Oliver Ryan (Notts County SC) and a £10 voucher won by Sam Knight and John Knight / Julian Mecklenburg (Bartley SC). The next event on the Rope4Boats Northern Tour is the Great Northern Asymmetric Challenge at Bassenthwaite Sailing Club on 13/14th April. See you all there for more sailing and social!